Wolves Heroes » Blog Archive » Crushed! 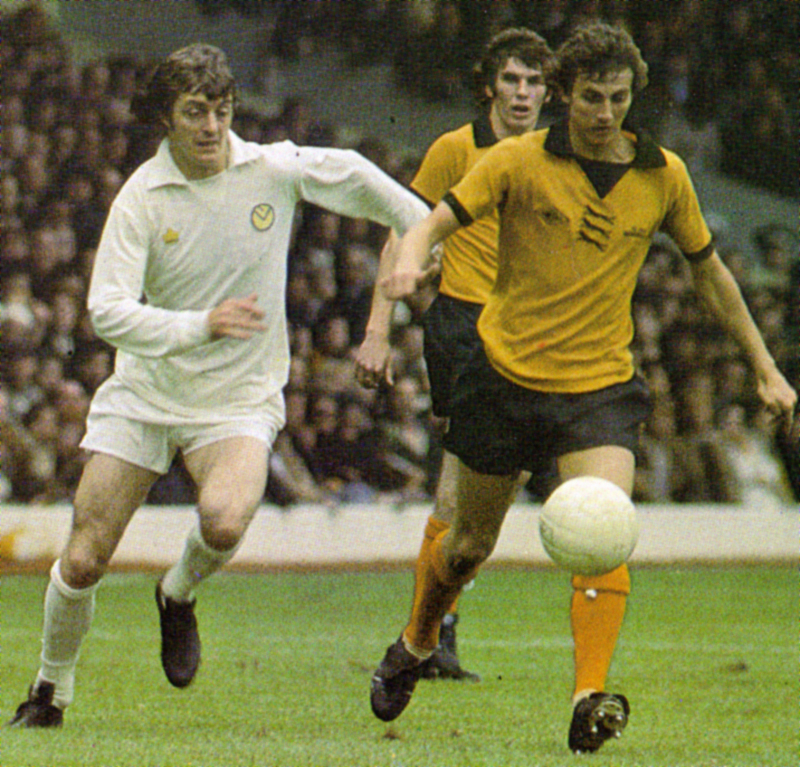 Barry Powell pictured with Allan Clarke in a League game against Leeds. As a beaten FA Cup semi-finalist and a twice Wembley winner, Barry Powell knows something about the emotions Wolves and their supporters are going through right now. 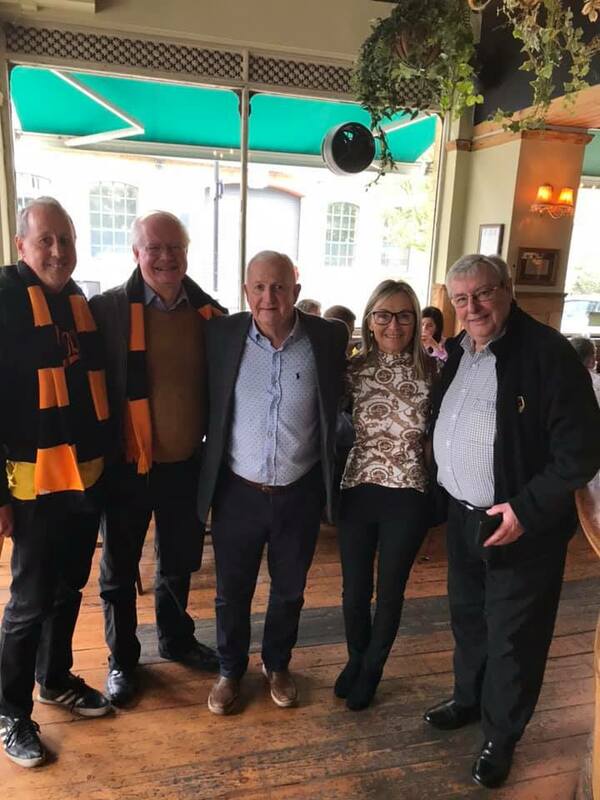 The former midfielder was among the gold and black masses left heartbroken by yesterday’s big turn-around – and can remember the contrasting feelings he experienced when in the club colours more than 40 years ago. Like Nuno’s men, he knew the devastation of defeat at this stage – and it was probably worse then because elimination against Leeds at Maine Road 46 years ago to the very day meant there was no trip to the twin towers. But – and here is something for the 2018-19 crop to help them lick their wounds – he and his team-mates were back at Wembley less than a year later and this time they were victorious; by coincidence, against the club Wolves had hoped to be facing in a few weeks’ time. “There is such a huge difference between winning and losing,” said Powell, who travelled to the game with his wife Tina, Wolves Heroes’ David Instone and one of the Express & Star fan writers, John Lalley. “We were gutted when we lost to Leeds in the semi-final. We played well and didn’t know how we lost really. “I was new to the side and hardly out of my teens. It was something like my fifth game in the first team and I remember Bill McGarry telling me beforehand to snap away at the ankles of Billy Bremner and Johnny Giles in their midfield when they had the ball – and to run past them when we had it. “We did everything but score and I missed one of our chances when Kenny Hibbitt set me up with a ball he weighted just right and David Harvey made a good save from my curling shot. John Richards also hit the inside of the post. “We were gutted afterwards but I remember Bill being good with us and pointing out all the things we had done well. “We were obviously a good side because we went all the way in the League Cup the following season and I went on as substitute for Dave Wagstaffe in the final. Powell had gone to Coventry by the time Wolves lost FA Cup semi-finals against North London opposition in both 1979 and 1981, Arsenal again proving a nemesis when beating Mark McGhee’s side back at Villa Park in 1998. The sight of Watford pulling a remarkable victory out of the jaws of defeat yesterday makes it five successive semi-final defeats in the competition since Wolves last won it in 1960. The thrilling tie also ended Wolves’ run of six consecutive Wembley victories, stretching from the 1949 FA Cup final to the Premier League away win over Tottenham in December. Powell was working at Graham Turner’s side when Wolves won the Sherpa Van Trophy by beating Burnley 2-0 in 1988 and recalls asking the manager whether he could briefly leave the dressing room a few minutes before kick-off so he could hear the singing of Abide With Me. For the record, Wolves bounced back from their 1973 heartbreak by beating Everton 4-2 at Molineux seven days later. A John Richards hat-trick helped lift any lingering clouds for a side including Powell and skipper Mike Bailey, who was among the other former players spotted at Wembley yesterday. Powell (centre) with wife Tina and friends yesterday. Others said to have been there are Bobby Gould and Colin Taylor while Steve Bull was carrying out corporate duties with Tim Sherwood and the broadcasting area contained Mel Eves, Andy Thompson and Richard Stearman, all of whom were working for local radio. Posted on: Monday, April 8th, 2019.